If you've taken a chance on the Cube World alpha, you might've noticed one thing. Aside from the beautiful voxels and the open-world landscape, I mean. At the moment, the game doesn't really tell you how things work. In a way, that mysterious nature is part of Cube World's charm. Still, I figure there are some things you should know that might help you enjoy the experience more than just running in blindly. Here are some of my tips for making the most of the Cube World alpha. Alpha is the key word here! Things might change as the game gets closer to the full release. Race doesn't matter in this game; it's all cosmetic. Wanna be a reptar-like Lizardman? Go for it. Wanna be a bunch of bones? Play as an undead! What will affect your game is your class—but still, don't feel you need to go one class over the other. You can make multiple characters if you want. But if you're curious, the classes available are warrior (close-range combat class that can use great weapons, one handed weapons, shields, heavy armor), ranger (long-to-mid-range combat that uses bows, crossbows and boomerangs), rogue (high damage, low health melee class that is highly mobile, can use stealth, and use daggers, longswords and fist weapons) and mages (magic users that can use wands, staves and bracelets). What sounds best? You should go with that. When you start out, Cube World asks you to create the playground in which your adventures will take place. To do this, you have to pick a "seed"—which is just a number that makes the world. The number you pick doesn't matter (although if you disagree, you should know there are people cataloging what different seeds contain), but make sure to make a duplicate world with the same seed number. This way, you can use one seed for adventuring, and the other to have a character perpetually in town. Characters are persistent across worlds, which means that regardless of where you're at in the "adventuring" seed, you can just boot up the "home" seed and resupply. That's a useful thing to have considering the game doesn't have fast-travel. There's nothing specific you need to do in Cube World. Although there are things can be considered quests, there's no specific timeframe to complete any of them. So why not let yourself explore however you see fit? You can always return to areas of interest if you want. I wouldn't even worry too much about exploring places that look dangerous: there's no penalty for dying (just know that chances are, groups of enemies will be able to mess you up at starting levels). So far, the best time I've had in Cube World is aimlessly exploring and seeing what I find. Like I said in my impressions article, the first few levels/hours of Cube World can be grueling between difficult enemies and slow leveling. Having others aid you in battle can help here. If you're not keen on the idea of playing with other people—which is fair—you should totally look into getting a pet. 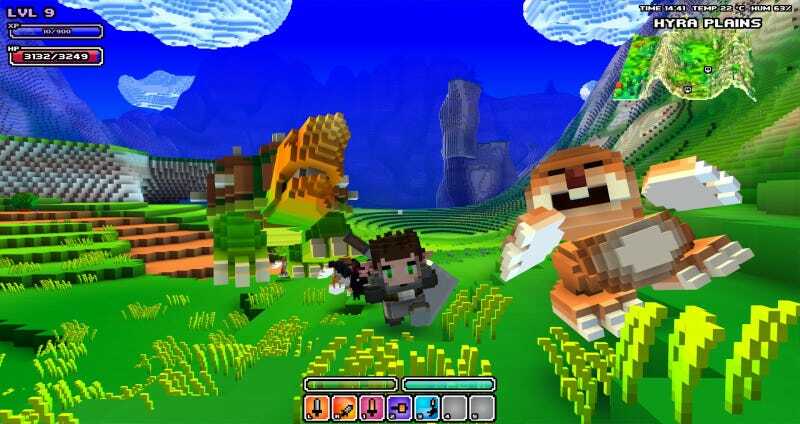 Not only are the creatures in Cube World insanely cute, they can be a menace in battle, too. In order to get a pet, you'll need to tame an animal. To do that, you need special food that you feed to the pet, which then wins them over. Each pet has a different preferred food. The main issue is that getting the pet that you want is difficult, as almost all of the item drops in Cube World are random. If you battle enough enemies, they'll eventually drop treats. Your starting town—which you always spawn close to in a new game—also typically has a shop that sells at least one treat. Here are a few pet/food combos, taken from the Cube World Wiki. Bonus? If you spec your character the right way, you can even ride some of these pets—which means slightly faster travel. In order to allocate skills and points, press X after you level up. There aren't too many options as of yet, but don't feel like you're boxed into any specific skill tree. If you go into town and stand next to trainers, the game allows you to respec. As you explore, you'll pick up materials that you can use to make stuff—namely, potions/consumables, armor and weapons. When it comes to potions and consumables, you'll be using a campfire or the craft menu, which you can bring up by pressing "C". Campfires, meanwhile are scattered around the world randomly. Basic life potions require you to combine heartflowers and water flasks; you can purchase flasks in town. You can convert those into water flasks by going into your inventory while in water and selecting the flask, then pressing the big sword icon. One click nets you one potion; it's cumbersome when making dozens of them, but still, that's how you do it. Aside from potions, other consumable items can be made depending on what you have on-hand. Press "C" and click on the ingredient, and the bottom right menu should display a recipe. All you have to do is find the other items; the menu should tell you ratios. For weapons and armor, you'll need to go into your town's crafting district. Depending on what material you have—which you get by picking up resources around the land, either out in the open or inside caves—you'll use different areas of the crafting area. If you're dealing with cloth, for instance, you'll use the clothier. What you can make is determined by what recipes you have, and recipes, like everything else, are either randomly dropped by enemies or can be purchased in-town. Personally, I watched this video by WhuzzBuzz to understand how to go about crafting weapons and armor. While it's clear where you need to go, the way to navigate specific crafting menus required visuals to understand. What's worth noting is that although in my experience the resources needed to customize weapons are rare—most caves only have a couple of things to mine, and elemental cubes are only obtained by defeating bosses—you should still make an effort to collect as many as you can. The more you add to your weapon, the more powerful it can become. That, and if you're crafty enough, you can make a weapon look much cooler, too. You should customize your weapon even if you don't have enough cubes to make the new weapon look good. Q is the hotbutton for potions, it'll default to whatever potion you have first in your inventory—so switch stuff around. If you're in a battle you'll want life potions first, since these are the only healing items which let you consume them while also running. Don't bother using a potion if a camp with a mat is nearby, as you can heal by sleeping on the mat. Remember that you can roll by pressing mouse button three; rolling is useful for evading attacks. If you roll before hitting the ground, you don't take falling damage. Traveling during the night is a hassle thanks to lack of visibility, but if you sleep at an inn, it'll automatically become morning. CNTRL lets you climb things, depending on your stamina. Some enemies drop "leftovers," which are items you can identify in-town at the shop with a magnifying glass icon. If you're curious about modding, this Pokemon mod tells me that the community is quite healthy. Look at this awesome Skyrim weapon, for example, or even this Wind Waker boat. EDIT: This glitch no longer works, as it was patched out. Still, this is a cool video of (glitched) gliding in Cube World. Finally, for some of you, actually being able to purchase the game would be the most useful tip at all, as the store keeps going down. As of this writing? You can purchase the game here; the store isn't down right now. If you're reading this and that isn't true anymore, this site keeps track of when the shop and registration are up. Hopefully these tips help demystify some of Cube World's obtuse, sometimes unclear systems (hey, it's in alpha!) Now get out there are get lost in that marvelous world.